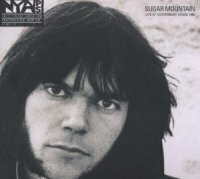 DVD: Neil Young archives vol. 1 trailer. Endearing Performance submitted by Catvana on June 15, 2014, 5:56pm This is such incredible CD! I don't usually like live performances but this was so heartwarming. Neil Young was so endearing in his conversation to the audience. His dialog was interesting and then he would launch into a song with his iconic voice. This CD was such a pleasure. Burbank, CA : Reprise Records, p2008. Description: 1 sound disc : digital ; 4 3/4 in. + 1 DVD.